A meteor and the barred spiral galaxy NGC-2903 grace the top of this October 14 image of an area of space near the head of the constellation Leo. The meteor and the galaxy were purely coincidental, as it is what is not visible in the image that is important. Two telescopes operated by astronomers at the Marshall Space Flight Center just stopped scanning the skies for Comet Elenin, which began fading and breaking apart back in August. Its close approach to the Sun on September 10 apparently caused the comet to disintegrate even further, into objects so small they are unable to be seen by ground-based telescopes like the 20″ instrument which took this picture. An anticlimatic end to the so-called “Comet of Doom”, with only empty space to mark its close approach (22 million miles) to Earth. 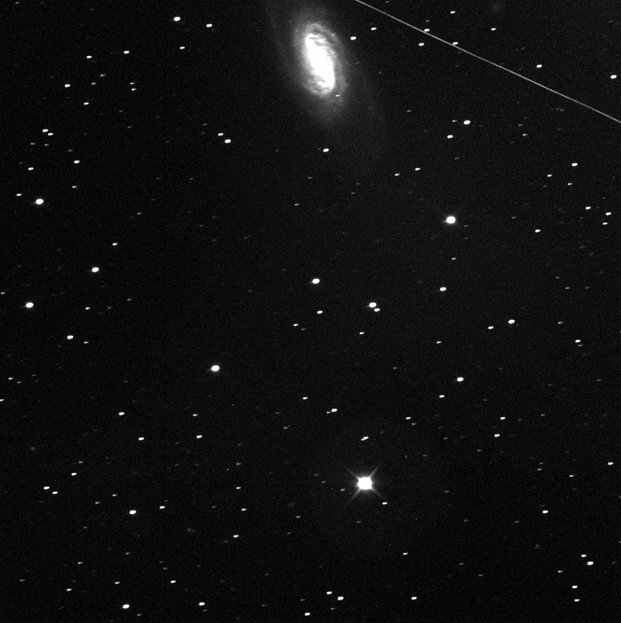 By the way, the galaxy NGC-2903 is 30 million light years distant from our own Milky Way.